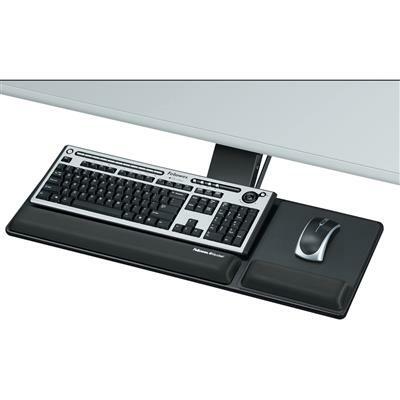 Compact keyboard tray is fully adjustable to work well in smaller work spaces. Loosen single knob to adjust tray height and tilt (negative 10 degrees), and then retighten knob to lock in position. Keyboard tray swivels 360 degrees and adjusts in height from 4-1/4"" below track to 1-1/4"" above track. Warning Trak helps prevent the mouse from sliding off the mousing platform. Soothing memory foam places the hand/wrist in a neutral position and features Microban antimicrobial protection so the keyboard tray stays cleaner. Standard 19"" x 9-1/2"" platform accommodates right-handed and left-handed mousing. Track length is 17-5/16"".